Geek Girls Rule! #237 – Review: Expedition to the Mountains of the Moon by Mark Hodder – Geek Girls Rule!!! I cannot wait until book 4. Seriously. I would like to begin this review by stating that I am not sure whether I want to hug Mr. Hodder or punch him. 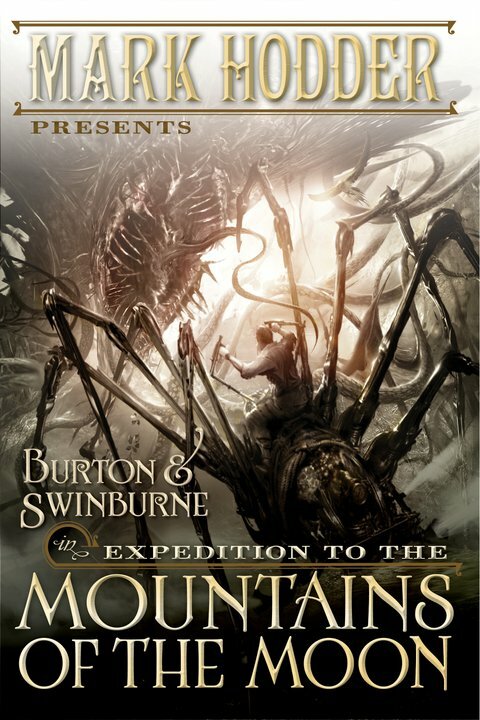 Expedition to the Mountains of the Moon , the third book in the Burton & Swinburne series (the reassurance on twitter that #4 is coming along, currently has me leaning toward hugging) is far, far more dense than the previous two. It has concurrent timelines that mean you have to pay close attention to what’s going on. I’ve got a pretty phenomenal reading comprehension and retention (best Trivial Pursuit partner EVER! ), but I found myself going back several times to re-read passages or even chapters to make sure I had actually read what I thought I had. The story is just as engaging as the first two, the characterizations as vibrant and interesting. It’s just that the plot(s) are more intricate and, like I said, more dense. Also he kills off characters in this book with the abandon of Martin or Erikson. Now, because of the nature of the book, involving time travel and alternate histories, we shall see whether they all stay dead. Granted, the fate of Algernon Swinburne made me smile. The thing is, when he kills them, he doesn’t give you time to grieve. Because a character is dead (not saying who or when) but you’re still in the thick of action or plot, and you just don’t have time for the long drawn out sobbing fits that generally follow the deaths of characters I like, because crying would get in the way of focusing on exactly what the hell is going on here. In this book, Palmerston sends Burton and Swinburne to Africa, to the Mountains of the Moon in 1863, to retrieve the last of the Eyes of the Naga, the black diamonds that powered Spring-Heeled Jack’s suit, before his former partner John Speke and the Prussians can. They are beset by accidents and sabotage almost immediately, and crash in the desert, where they are rescued by Burton’s former fiancee Isabelle Arundel, now the leader of a group of women who have become warriors, the Daughters of Al Manat. The expedition experiences many trials and tribulations, and eventually split up in order to harry the Prussians, and send warning back to England about the increased Prussian presence in Africa. In the concurrent timeline, Richard Burton sent to the year 1914, somehow, struggles to regain his memories and figure out exactly why he’s been sent to the future. His recapturing of his memories echoes the 1863 storyline and they are recounted in alternating chapters. He meets H. G. Wells, who is reporting on the war in Africa, and they travel together as Burton pieces together his memories, evading the Prussians, and eventually Aleister Crowley. Again, the characterizations are excellent. The plotting is tight, if a little slow in places, but maybe it’s really less slow and just, as I said before, dense. It requires thought to penetrate. This is not nearly as easy a read as the first two. In my mind it’s just as good, but requires a little effort on the part of the reader. The end in particular… well, let’s say my first instinct was not hugging. I recommend the first two of this series to just about anyone. But do not come whining to me if this third book requires more thought and focus than you’re used to. If you like the blog or the podcast, or if you would like to help fund our… let’s face it, I always need more money for books, please, please, please donate to keep us going. Donations go to pay for the podcast hosting and website domain, primarily. T-shirts will happen, however, vet bills and end of life cat care have sort of put everything else on hold for awhile. Oh, and Honey Badger’s first two songs are available for download here, for free or pay what you want. Also, we have stickers!!! !